This video shows us cleaning a red Dodge Ram full size pickup truck in only 6 min 30 sec. It shows how long it takes to clean a car with our 120 Volt, 15A professional / commercial dry vapor steam cleaner. It shows the Dry Carwash being done in wet steam mode, chemical injection and dry. Also we are using a waterless car wash solution in our chemical injection system. You will also see us using the Vapor Rino commercial steam cleaner to clean a tire, rim, door jam and door panel in the truck. Seeing is believing. for even more power consider our 230v version. Thank you for watching! This video will show you how to connect a 230Volt Vapor Rino to a generator! A MUCH WATCH for those considering working with a generator. Seeing is understanding. Sold by a third party! Watch us wash this muddy truck door with nothing but DRY Vapor Steam. No hot water injection, just dry steam all using the 120V Vapor Rino. The Silver Car is used with both hot water injection and dry steam. Both systems were 120 volt units. Get our 230 Volt version for even faster results. Amazing footage of our 120 Volt Vapor Rino in action. Watch us tackle the inside of that same Dodge truck you saw in the carwash video. Our High PSI Vapor Steam Cleaners can make easy work on many of the tasks an auto detailer faces inside the car or truck. See the 120 Volt Vapor Rino tackle this old golf cart. Watch us restore the Vinyl Seats (leather Cleaning), clean wheels, rims, restore plastic windows and much more. Great video. It will help you learn how you can use your new Vapor Rino. Vapor Rino Promo Video - It's Here! A short dramatic video boasting about the basic features of the Vapor Rino 145 PSI System. This video was given to us by an end user that purchased our system. In this video they are using a 120 volt, 145 PSI Vapor Rino to dry car wash a high end vehicle, a Farrari. Keep up the god work, we love the videos. This video was given to us by an end user that purchased our system. See them clean the engine of this restored classic truck. Pay close attention to when they activate the chemical injection. Their soap solution is thin so it may be hard to notice if your not watching close. This video was given to us by an end user that purchased our system. You will see them simultaneously dry car washing AND applying wax at the same time. Fast and efficient. They are using a 120V Rino. Can you imagine if they had the King Class, 230V? Either way, steam works! Dry Car Wash - Porsche 911 No Clay? This video was given to us by an end user that purchased our system. See them dry carwash this Porsche, use the injection system on the wheels, glass and more. Testimony on efficency and time saving uses. Dry Carwash PART-1 Winter Car Wash! How fast can you clean a car with our dry car wash vapor steam cleaning systems? Lets take a look. We will be using a small 120V system in the class of the VC 4000-C water or VC 5000-Ci soap systems. Easy work, fast results, winter or summer! Remember, a 230 Volt system means more power and speed! Clean Leather Seats INSTANTLY! Steam really does the job. This was a video we produced many years ago. You will see one of our smaller systems totally restore this dirty leather seat. We now offer ULTRA SOFT Horse Hair brushes! They are perfect for this kind of work. Easy, Fast, Effective! Dry Vapor Steam Cleaners work. Dry Carwash PART-2 Winter Car Wash! Part 2 will show us cleaning a wheel, rim, the bumper, the injection in use and we will show the removal of some sticker glue on a headlight! Done with a120V commercial vapor steam cleaner in the class of the VC 4000-C water or VC 5000-Ci soap systems. Easy work, winter or summer! More Power? 230 Volt system means more power & speed! 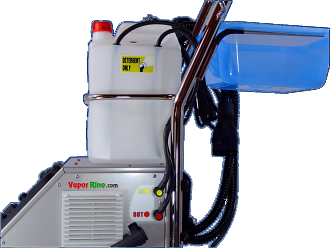 The Vapor Rino IS EXTRACTOR READY!Shows upholstery cleaning both with & without the new 3 in 1! Vapor Rino, amazing in every way! This is an amazing view of the Vapor Rino 145 PSI Steam system cleaning a large number of surfaces. From dry car washing, auto detailing, crayon removal on walls, mildew, tile and grout, candy removal from fabric, cleaning lawn equipment, cleaning engines, and so much more. This video shows us detailing a dirty KLR 650 Motorcycle with the 145 PSI Vapor Rino Dry Steam System. Watch the performance of the Vapor Rino 230V King Class Dry Vapor Steam Cleaner. Notice the and demand, gun activated hot water and soap injection. The VR 145 King Class is the ideal mobile or stationary detail cleaner. Dry steam mode running at around 2.5 gallons of water PER HOUR and even with the injection system on it still only uses around 4.5 gallons per hour! Incredibly efficient, environmentally friendly, low water use and most importantly, highly effective. Tile & Grout Cleaning - Made Easy! Watch one of our smaller vapor steam cleaners cleaning tile and grout. TIME TEST FOOTAGE. How fast can a 120V steamer clean floor grout? Results may vary but the video speaks for itself. The 230 Volt versions will do the job faster! Watch us clean a home and a commercial air conditioning system. We will be using a small system like the 72 PSI VS900 systems. Remember, a 145 PSI, 230 Volt system means more power and speed! Dry steam has thousands of powerful uses. Use your imagination, experiment and explore! This is some of our oldest footage shot about a decade ago. We were using a smaller 72 PSI system like the 4000 - 5000 systems. Great for cleaning & sanitizing sinks, toilets, walls, floors, urinals, handles, fixtures and more. An amazing Janitorial Tool. Archive Footage from our humble early years. Please forgive the quality of the following videos. We have posted them to give you an idea of the possibilities in the Janitorial Field. We will be working toward producing new Janitorial content in the future. Thank you! Want grease cutting power? This video shows the power of a dry vapor steam cleaner at work in a commercial kitchen at only 65 psi and with NO Soap. What it does not show you is the extreme power of a chemical injection unit or the high 145 PSI of a Vapor Rino. More is better! As you can see from the video, dry vapor and with the right attachments (included!) can do wonders. There are many cleaning situations that require a little extra thunder, and perhaps a bit of lightning if you know what I mean. With a chemical injection unit like the VC5000-Ci or Vapor Rino 145 Industrial dry vapor steam cleaner you can inject your favorite detergent right into the steam flow with the press of a button right on the steam gun. There is no question about it, if its a greasy commercial kitchen your looking to clean, a chemical injection unit is the gold standard in dry vapor cleaners. Not only hotels, but thousands of business and home owners are reaping the benefits of steam. Hotel housekeeping is a full time job and often, some of the jobs are very difficult. One such job is floor grout cleaning in lobbies and bathrooms. A vapor steam cleaner can allow you to clean your lobby floor grout with ease and very little water. Another application is AC/Heater coil cleaning. Did you know a clean AC unit can run as much as 10 to 20% more efficiently? This can save you money. Interested in disinfecting surfaces and killing bedbugs, lice, scabies, flees, or simple dust mites? Dry vapor steam does a great job of mattress sanitizing, rug sanitizing, furniture sanitizing and more. The also have the ability to blast super heated steam deep into cracks and crevices where bedbugs hide. Note: The red steamer in this video is no longer available. ALL of our steamers at Vapor Rino perform the same come with the steam mop feature included free! Our dry vapor steam cleaner systems come with a multi-function large floor brush with spring loaded clips and a easily replaceable mop head! Note, you can buy and attach your OWN towels purchased from local hardware stores like lows or home depot. Other brands force you to use their expensive special fit heads. We save you money! More resurrected archive footage! Learn how to use the Large Triangle Brush / hand held steam mop with brush attachment. Comes with the Vapor Rino. We offer a full line of home and commercial steam cleaner attachments here. When it comes to residential or commercial steam cleaners or dry vapor steam cleaner systems attachments matter! As you can see in this video, the large triangle brush is a high quality, impact resistant long lasting commercial steam cleaner accessory. It can be used as a stand alone steam scrub brush or attach a common micro fiber or cotton terry towel and it becomes a powerful hand held commercial steam cleaner steam mop. This is some of our oldest footage shot about a decade ago. We were using a small system like the VS900 systems. Great for cleaning & sanitizing sinks, toilets, walls, floors, urinals, handles, fixtures and more. An amazing Janitorial Tool. Tile and Grout Cleaning - Made Easy! Watch us clean a home and a commercial air conditioning system. We will be using a small system like the VS900 systems. Remember, a 230 Volt system means more power and speed! Dry steam has thousands of powerful uses. Use your imagination, experiment and explore! Hotels Motels & Janitorial Not only hotels, but thousands of business and home owners are reaping the benefits of steam. Hotel housekeeping is a full time job and often, some of the jobs are very difficult. One such job is floor grout cleaning in lobbies and bathrooms. A vapor steam cleaner can allow you to clean your lobby floor grout with ease and very little water. Another application is AC/Heater coil cleaning. Did you know a clean AC unit can run as much as 10 to 20% more efficiently? This can save you money. Interested in disinfecting surfaces and killing bedbugs, lice, scabies, flees, or simple dust mites? Dry vapor steam does a great job of mattress sanitizing, rug sanitizing, furniture sanitizing and more. The also have the ability to blast super heated steam deep into cracks and crevices where bedbugs hide. Archive Footage from our humble early years. Please forgive the quality of the following videos. ((A Must Watch)) This video will show you how to connect a 230Volt Vapor Rino to a generator! A MUCH WATCH for those considering working with a generator. Seeing is understanding. Vapor Rino Now EXTRACTOR READY! Video shows upholstery cleaning both with & without the new 3 in 1! New 3 in 1 Extractor videos coming soon. Rino, amazing in every way! This is an amazing view of the Vapor Rino 145 PSI Steam system cleaning a large number of surfaces. From dry car washing, auto detailing, crayon removal on walls, mildew, tile and grout, candy removal from fabric, cleaning lawn equipment, cleaning engines, and so much more. See the impressive power of dry vapor steam in action and learn about the many world class features of this remarkable system. Vapor Rino, impressive power, amazing quality and versatility all at a fantastic price point. Beware of imitators and those that will mislead you. There is only ONE Vapor Rino vapor steam cleaning sytem! You have found it. Dry Car Wash #2 with Vapor Rino. See us wash this red truck side in only 6 min 30 sec! / Automotive Detailing This video shows us cleaning a red Dodge Ram full size pickup truck. It shows how long it takes to clean a car with our 120V professional / commercial vapor steam cleaner. This TIME STAMPED footage shows the Dry Carwash being done in wet steam mode and dry. Also we are using a waterless car wash solution in our chemical injection system. You will also see us using the Vapor Rino commercial steam cleaner to clean a tire, rim, door jam and door panel in the truck. Seeing is believing. for even more power consider our 230v version. Thank you for watching! Part 2 will show us cleaning a wheel, rim, the bumper, the injection in use and we will show the removal of some sticker glue on a headlight! Done with a120V commercial vapor steam cleaner in the class of the VS900 water or VS900 soap systems. Easy work, winter or summer! More Power? 230 Volt system means more power & speed! How fast can you clean a car with our dry car wash vapor steam cleaning systems? Lets take a look. We will be using a small 120V system in the class of the VS900 water or VS900 soap systems. Easy work, fast results, winter or summer! Remember, a 230 Volt system means more power and speed!